The invention relates to a cosmetic composition, comprising an aqueous dispersion of polysiloxane/polyurea copolymer and a silane and a method for cosmetic treatment using said composition. COSMETIC TREATMENT The present invention relates to cosmetic compositions comprising aqueous dispersions of silicone copolymers, in particular non-ionic and hydrogen bonding donors, mixed with a silane, and their use, in particular for cosmetically treating the hair. Hair shaping is typically provided by a film-forming polymer deposit on the fiber surface, via the use of styling product. It is important that this polymer has a good affinity with fiber, good styling properties while keeping a nice cosmetic touch, especially good softness and lack of stickiness. This formatting mode still some problems, including persistence over time: in fact, the polymer can become brittle under the constraints of hairdressing; moisture-retentivity problems: the formatting can be removed by washing with water or in the presence of surfactants; or so-called charge touches problems, feels rough and / or unnatural. Furthermore, low-VOC compositions (VOC) are especially sought after. Hair shaping can also be carried out by chemical treatment of the fiber such that the permanent. In this case, the hair shaping has improved durability compared to the formatting using a styling product. However, this gain in durability is done via a chemical treatment generally amending intimately the hair proteins and likely to cause a greater or lesser degradation of the physico-chemical properties of the fiber, particularly its softness , its hydrophilicity and / or intrinsic mechanical strength. Therefore a object of the present invention is to provide a means for arriving to a durable shaping and non degrading to the fiber, this thanks to the combined presence of a silane and a dispersion of poly mother, while providing also thanks to the presence of silane, a good remanence depositing latex (aqueous dispersion of polymer), particularly remanence to shampoos which will result in improved persistence of the shaping hair. It also wants a natural appearance of the hair shaping and improving the strength of the deposit to mechanical abrasion, which will result including better combing strength (lack of appearance of particles). Applicants have surprisingly discovered that the joint use, in a cosmetic composition, an aqueous dispersion of copolymer nonionic sili- cone and a silane, could allow to make such a durable shaping in time , non degrading to the fiber, volatile and resistant aunt. It is known that the introduction of water in compositions comprising nonionic silicone polymers is difficult. Indeed, if the silicone polymer does not have any hydrophilic grafts and / or high concentrations of surfactants are not introduced in the formulation, there occurs precipitation of the silicone making possible its formulation. The addition of high concentrations of surfactants does not always desirable. Particularly in unrinsed applications, the unremoved surfactant may cause a modification of the mechanical properties of the deposits, in particular a lamination, or the occurrence of said charge touches (bold, transferring on the fingers) particularly in the field of haircare. It is known in the prior art to prepare aqueous dispersions of silicone polymers. Thus, document US2005137327 describes the synthesis of aqueous dispersions of organopolysiloxane / polyurea by a process which comprises dispersing an organopolysiloxane terminated with amine groups in an aqueous acidic solution preferably comprising a surfactant, adding a diisocyanate and then adding an base to return to neutral pH and cause polycondensation tion of the amine organopolysiloxane with the diisocyanate in order to finally obtain a polyorganosiloxane copolymer / polyurea dispersion. However, this approach requires the handling of diisocyanates which may pose toxicity problems. Moreover, diisocyanates can react with water and form a more or less substantial amount of above-diamine ceptibles to intervene in the polymerization: this can influence the polymerization or undermine its control and the nature of the final dispersion obtained. Finally, the addition of acid in a first and then of a base in a second step can be problematic for sensitive compounds in an alkaline and acidic medium. In addition, this method causes the formation of salts which wind peu- harm compositions comprising subsequently the thus prepared dispersions. FR2708199 discloses the meanwhile the synthesis of aqueous dispersions of polyurethane / polyureas anionic or cationic. According to the method, it is necessary to introduce a sufficiently large amount of ionic groups to afford a dispersion in water of the polymer. However, it was found that excessive levels of ionic units could result in diminished strength of the polymer to moisture. In addition, there are a limited number of anionic or cationic units can be introduced during the synthesis, thus limiting the chemical diversity of the polyurethane or polyurea. In addition, the stability of the polymers prepared by this process is dependent on the pH of formulation which can limit their field of formulation. In these documents, it is found that the polymer dispersion is generally prepared from monomers which are synthesized directly in the required solvent or another solvent, then the synthesis is in this case followed by a step change solvent. In the present invention, the aqueous dispersion of silicone copolymer is prepared from the already formed polymer. The method implemented in the context of the invention allows the introduction into the composition comprising the dispersion of silane compound generally very compatible with such an aqueous polymer dispersion. Indeed its introduction generally causes an almost instantaneous precipitation of the polymer in aqueous medium. An object of the present invention is thus a cosmetic composition comprising an aqueous dispersion of polysiloxane / polyurea obtained from the reaction between at least one polymer of formula (I) as defined below and at least one diisocyanate derivative pattern, said composition further comprising at least one silane structure as defined below. Another object of the invention is a cosmetic treatment process, especially a makeup, care, cleansing, coloring, shaping, of keratin materials, especially the skin of the body or face, the lips, nails, hair and / or the eyelashes, comprising the application to said materials of a cosmetic composition as defined above. Another object of the invention is a kit of two or more parts comprising at least one cosmetic composition. - at least one derivative diisocyanate pattern. Optionally, it may also be reacted in addition at least one additional nonionic pattern, having at least two reactive functions with labile hydrogens. - n is an integer such that the average molecular weight of the polysiloxane segment is between 300 and 10 000 g / mol; preferably 500 to 8,000 g / mol. As radicals R1 of suitable within the scope of the invention, mention may more particularly be mentioned alkyl radicals in C1 -C20, and in particular methyl, ethyl, propyl, isopropyl, butyl, pentyl, hexyl, octyl, decyl, dodecyl and oc- tadécyle; cycloalkyl radicals C3-C7, in particular the cyclohexyl radical; aryl radicals, in particular phenyl and naphthyl; arylalkyl radicals IT, PARTICULARLY benzyl and phenylethyl, and tolyl and xylyl radicals. with n such that the number average molecular weight (Mw) is between 300 and 10 000 g / mol. Optionally, it may be reacted further one or more other polymers containing reactive ends with labile hydrogens, especially chosen from polyethers, polyesters, polyolefins, polycarbonates, polyamides, polyimides, polypeptides. It is obviously possible to react a mixture of different polymers of for- mula (I). 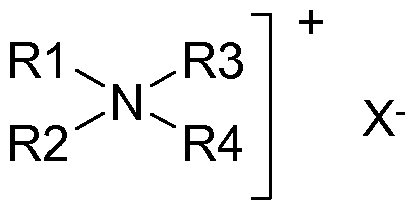 The diisocyanate can be represented by the general formula (II): OCN-R-NCO, wherein R is a divalent alkylene group, C1-20 linear, branched and / or cyclic, saturated or unsaturated, or even aromatic, which may be substituted or not by one or more heteroatoms (especially O, N, S, P). wherein b is an integer between 0 and 3 and c an integer between 1 and 20. Preferably, is chosen from hexamethylene diisocyanate-1, 6-diisocyanate, tetramethylene-1, 4-diisocyanate, 4,4'-methylenedicyclohexyl, methylenediphenyl-4,4'-diisocyanate, 2,4 -toluènediisocyanate, 2,5-toluene diisocyanate, 2,6-toluene diisocyanate, m-phenylene, p-phenylene diisocyanate, m-xylene diisocyanate, tetramethyl-m-xylene diisocyanate, naphthalene diisocyanate on the butanediisocya- nate, the 'hexyldiisocyanate, isophoronediisocyanate. These diisocyanates may well be heard alone or as a mixture of two or more diisocyanates. - R 'is a divalent alkylene group having 1 -20 linear, branched and / or cyclic, saturated or unsaturated, which may be unsubstituted or substituted by one or more heteroatoms (no- MENT O, N, S, P). propane diol there may be mentioned (1, 2- or 1, 3), butane diol, neopentyl glycol, cyclohexane diol. According to the invention, the copolymer is a polysiloxane / polyurea nonionic, that is to say it does not contain ionized or ionizable group. Preferably, it is a block copolymer. In the context of the invention block copolymer means a copolymer consisting of at least two distinct sequences of each of the polymers constituting the copolymer in the copolymer backbone. For example, the copolymer of the invention contains at least one sequence (or block) of polysiloxane and at least one sequence (block) of polyurea in the copolymer backbone. As indicated above, the copolymer of the invention may comprise in addition to the polysiloxane / polyurea other blocks of different patterns. Particular examples are terpolymers polysiloxane blocks / polyurea / polyurethane. According to a particular embodiment, the copolymer contains an amount by weight greater than 5% polysiloxane. According to a particular embodiment, the amount of polysiloxane in the copolymer is a majority, preferably greater than 90% by weight relative to the total weight of the copolymer. According to a variant, the copolymer contains only one or more blocks if- siloxane and one or more polyurea blocks. - d is a number greater than 0; with the proviso that A is in at least one of units (a) an NH radical. Preferably, R represents a monovalent hydrocarbon radical in C1-C6, for example methyl, ethyl, vinyl and phenyl. According to a particular embodiment, R is an unsubstituted alkyl radical. Preferably, X represents an alkylene radical C2-C10. Preferably, the alkylene radical X is not interrupted. According to a particular embodiment, the group A in all the units (b) and (c), when present, is NH. According to a particularly preferred embodiment, all the groups A represent an NH radical. Preferably Z represents an oxygen atom or an NH radical. Preferably, Y represents a hydrocarbon radical C3-C13, which is preferably unsubstituted. Preferably, Y is an aralkylene radical, alkylene, linear or cyclic. Preferably, D represents an alkylene radical with at least 2, especially at least 4 carbon atoms and at most 12 carbon atoms. Also preferably, D is a polyoxyalkylene radical, especially a polyoxyethylene or polyoxypropylene radical with at least 20, especially at least 100 carbon atoms and at most 600, in particular at most 200 carbon atoms. Preferably the radical D is unsubstituted. Preferably n represents a number of at least 3, especially at least 25 and preferably at most 800, in particular at most 400, particularly preferably at most 250. Preferably, a represents a number of more 50. When b is other than 0, b is preferably a number of at most 50, especially at most 25. Preferably, c is a number of at most 10, in particular at most 5. The copolymers of the invention can be obtained according to the poly- merization of methods described in the patent application US 2004/0254325 or WO 03 / 014194. Generally, in the first step, is brought out silazanes of the general formula (2) or (2 ') and the reactants containing silanol groups in equimolar ratios. For the preparation of silicones of high purity bisaminoalkyl termination, of the general formula (4) is preferably used, a small excess of the silazane compound of the general formula (2) or (2 '), which can then be removed in a simple additional process step, such as, the addition of small amounts of water. If b is at least 1, it can be implemented during the second step, up to 95% by weight, based on all the components used, of chain extenders, which are selected from diamines, hy- droxy compounds blocked isocyanate, dihydroxy compounds or mixtures thereof. Preferably, the chain extenders have the general formula (6): HZ-D-ZH (6) where D and Z have the above meanings. If Z has the meaning O, the chain extender of the general formula (6) can also be reacted before the reaction in the second step with the diisocyanate of the general formula (5). If necessary, we can implement water as chain extender. Examples of diisocyanates of the general formula (5) to be used are aliphatic compounds such as isophorone diisocyanate, hexamethylene-1, 6-diisocyanate, tetramethylene-1, 4-diisocyanate and 4,4'-methylenedicyclohexyl diisocyanate or aromatic diisocyanate compounds such as 4,4'-methylene diphenyl, 2,4-toluenediisocyanate, 2,5-toluenediisocyanate, 2,6-toluene diisocyanate, m-phenylene, p-phenylene diisocyanate, m-xylene diisocyanate, tetramethyl-m-xylene diisocyanate or mixtures of such isocyanates. An example of commercially available compound is a diisocyanate of the DESMODUR® series (H, I, M, T, W) from Bayer AG, Germany. aliphatic diisocyanates are preferred, wherein Y is an alkylene radical, because they lead to materials which exhibit improved UV stabilities. Alkylene terminated with α, ω-OH of the general formula (6) are preferably polyalkylenes or polyoxyalkylenes. They are preferably substantially free of contamination mono- polyoxyalkylenes, trifunctional or higher functional. Can implement here, polyether polyols, polytétraméthylènediols, polyester polyols, polycaprolactone diols, polyalkylene but also to termination α, ω-OH based on poly (vinyl acetate), co-poly (vinyl acetate) - ethylene, poly (vinyl chloride), of polyisobutyldiols. Preferably, use of polyoxyalkylated, particularly preferably, polypropylene. Such compounds are commercially available as raw materials inter alia, polyurethane foams and for uses such as coating, with molecular weights Mn of 10 to 000. Examples are polyether polyols and polyester polyols BAYCOLL® BAYER AG Germany or Acclaim® polyether Lyondell Inc., USA. Can implement also, of monomers α, ω-alkylenediols, such as ethylene glycol, propanediol, butane diol or hexane diol. Furthermore, by dihydroxy compounds in the sense of the invention is also meant the bishydroxyalkyl silicones, as they are provided for example by Goldschmidt under the names Tegomer H-Si 2111, 2311 and 2711. The copolymers described above for the general formula (I) may be in solution but also in solid form, either continuously or batchwise. If the amount of urethane or urea segments is large, a solvent is selected having a high solubility parameter, such as dimethylacetamide. One can also use THF. According to a particular embodiment, the syn- thesis of the copolymer is carried out without solvent. The synthesis is preferably carried out in the absence of moisture and under inert gas, usually nitrogen or argon. The reaction is preferably carried out in the presence of a catalyst. Suitable catalytic ers for the preparation are dialkyltin compounds such as dibutyltin dilaurate dibutyl tin diacetate, dibutyl tin, or tertiary amines such as N, N-diméthylcyclohexanamine, 2-dimethylaminoethanol, 4-diméthylaminopyhdine. According to a particular embodiment, the copolymer useful in the present invention contains no polyurethane. By way of example of a copolymer that may be mentioned the copolymer diméthylpolysi- siloxane / urea, INCI name polyureadimethicone. These include the commercial polymers Belsil type UD-60 (Wacker SLM TPSE Geniomer 60 or 60), UD-80 Belsil (Wacker SLM TPSE Geniomer 80 or 80), Wacker Belsil UD-140 (Wacker SLM TPSE 180 or 180 Geniomer Wacker BELSIL UD-200 (Wacker SLM TPSE Geniomer 200 or 200) marketed by Wacker. Preferably, the copolymers of the invention have a molecular weight (Mn) between 1000 and 5 000 000, especially between 2000 and 1 000 000 and more preferably between 2000 and 100 000 g / mol. Using an aqueous dispersion of these copolymers may require a dispersing process which preferably comprises the following steps: - solubilization of the copolymer in an organic phase composed of one or more solvents and / or cosmetic oils; - adding said organic phase comprising the polymer to an aqueous phase comprising one or more surfactants, followed by emulsification with rapid stirring. Optionally, a portion or all of the cosmetic solvents or oils used to solubilize the copolymer can be evaporated by any suitable technique considered by those skilled in the art, such as vacuum evaporation. One can thus obtain an aqueous dispersion stable silicone copolymer in time (no macroscopic phase separation after 5 days at room temperature). As solvent or cosmetic oil can be used in the context of the invention, there may be mentioned any liquid compound (at 20-25 0 C, 1 atm) insoluble in water and solubilizing the copolymer. 25 ° C, 1 atm) is less than 1% by weight. By solubilizing the copolymer is meant a compound which allows the solubilization of at least 1% by weight of polymer (at 25 ° C, 1 atm). Preferably, one uses at least one solvent compound having a boiling point below 150 0 C, 1 atm, and / or a solvent compound capable of forming an azeotrope with water. - silicone oils, volatile or not; polydimethylsiloxanes that may be mentioned (PDMS), polyorganosiloxanes phényltπméthi- phenylated, such as cones, phenyltrimethylsiloxydiphenylsiloxanes, diphénylméthyldiméthyltrisi- siloxanes, diphenyl dimethicones, phenyl dimethicones, polymethyl-phenylsiloxanes, optionally fluorinated; polysiloxanes modified with fatty acids, fatty alcohols or polyoxyalkylenes, fluorinated silicones, silicone Hui perfluorinated. Among the preferred silicone oils include polydimethylsiloxanes, polymethylphenylsiloxanes, silicones comprising polyoxyalkylene blocks or grafts, in particular polyoxyethylene or copoly (oxyethylene / oxy- propylene) such as dimethicone copolyols, silicones bearing both groups hydrophobic hydrocarbon (e.g. C 2 -C 3 alkyl o) and polyoxyethylene blocks or grafts or copolymerized ly (oxyethylene / oxypropylene) such as alkyldimethiconecopolyols, silicones bearing fluoro or perfluoro groups such as infants polydiméthylsiloxa- perfluoroalkyl and polymethyl perfluoroalkyl, and mixtures thereof. These silicone oils may optionally contain alkyl or alkoxy groups at the silicone chain or pendant. Mention may also be made of linear or cyclic silicones, and having particu- link of 2 to 7 carbon silicon. the octaméthylcyclo- cyclotetrasiloxane These include, decamethylcyclopentasiloxane, hexadécaméthylcyclohexasiloxa- do, heptamethylhexyltrisiloxane, heptamethyloctyltrisiloxane and mixtures thereof. Among these solvents, preferably chosen from ethyl acetate, butyl acetate, propyl acetate, isopropyl acetate, isopropyl palmitate, pentanol, hexanol, heptanol, heptane, decane, dodecane, isododecane, undecane, tridecane, cyclotetramethylsiloxane (D4), the siloxane cyclopentaméthylsi- (D5), the cyclohexaméthylsiloxane (D6), methyl ethyl ketone, toluene; and mixtures thereof. One can of course use a mixture of solvents. In a particular embodiment, employing a solvent of alcohol type C5-C20 linear or branched, alone or in admixture with an alkane, C5-C20, a cyclic volatile silicone oil and / or ester C4-C20 themselves alone or mixed. The surfactants which may be used may be anionic, cationic, amphoteric or nonionic surfactants; one may use a mixture of surfactants. Preferably, the surfactants are cationic or anionic, preferably cationic. the following anionic surfactants there may be mentioned, which may be used alone or as mixtures: there may be mentioned especially the salts, particularly the alkali metal salts such as sodium salts, ammonium salts, amine salts, amino alcohol salts or alkaline earth metal salts, for example, magnesium, the following compounds: alkyl sulphates, alkyl ether sulphates, alkylamido, alkylaryl, the monoglyceride sulphates; alkylsulfonates, alkyl phosphates, alkylamidesulphonates, alkylarylsulfonates, alpha olefin sulfonates, paraffin sulfonates; the sulpho succinates of alkyl, alkyl ether, the alkylamidesulfosuccinat.es; alkyl sulfoacetates them; acyl sarcosinates; and acylglutamates, the alkyl or acyl group of all these compounds containing from 6 to 24 carbon atoms and the aryl group preferably denoting a phenyl or benzyl group. Can also be used alkyl esters of C 6 -C 24 carboxylic polyglycoside- acids such as alkyl glucoside citrates, alkyl polyglycoside tartrates and alkyl polyglycoside sulphosuccinates; alkyl sulphosuccinamates, acyl isethionates and N-acyl taurates, the alkyl or acyl group of all these compounds containing from 12 to 20 carbon atoms. acyl lactylates the égale- can cite ment in which the acyl group contains from 8 to 20 carbon atoms. Mention may also be made of alkyl-D-galactoside uronic acids and salts thereof, polyoxyalkylenated (C 6 -C 24) ether carboxylic acids, polyoxyalkylenated (C 6 -C 24) aryl (C6-C 24) ether-carboxylic acids, polyoxyalkylenated ACI- alkyl (C6-C2 4) alkylamido ether carboxylic acids and salts thereof, in particular those comprising from 2 to 50 ethylene oxide groups, and mixtures thereof. Among the preferred anionic surfactants include the salts, in particular sodium, magnesium or ammonium alkyl sulfates; alkylether sulphates, such as sodium lauryl ether sulfate, preferably 2 or 3 moles of ethylene oxide; of alkyl ether carboxylates; and mixtures thereof, the alkyl groups generally having from 6 to 24 carbon atoms, and preferably 8 to 16 carbon atoms. Suitable nonionic surfactants used in the context of the invention, there may be mentioned alcohols, alpha-diols, alkyl (Ci-C 2 o) phenols or poly- ethoxylated fatty acids, polypropoxylated or polyglycerolated, having a fatty chain comprising, for example, from 8 to 18 carbon atoms, the number of ethylene oxide groups or propylene oxide may range from 2 to 50 and the number of glycerol groups to range in particular from 2 to 30. mention may also be ethylene oxide-propylene copolymers, ethylene oxide condensates of propylene oxide with fatty alcohols; polyethoxylated fatty amides preferably having from 2 to 30 moles of ethylene oxide, polyglycerolated fatty amides containing on average 1 to 5 glycerol groups and in particular 1, 5-4; the polyethoxylated fatty amines having from 2 to 30 moles of ethylene oxide; the esters of ethoxylated sorbitan fatty acid having 2 to 30 moles of ethylene oxide; the fatty acid esters of sucrose, fatty acid esters of polyethylene glycol, alkyl (C 6 -C 24) polyglycosides, N-alkyl derivatives (C 6 -C 24) glucamine derivatives, amine oxides such as the oxides of alkyl (Ci ClO 4) amines or oxides of N-acyl (C 0 -C 4) aminopropylmorpholine; and mixtures thereof. Y 'represents -COOH or the -CH 2 -CHOH-SO 3 H, Rz represents an alkyl group of an acid R 9 -COOH present in coconut oil or in hydrolysed linseed oil, alkyl , in particular Ci 7 and its iso form, an unsaturated group -C 7. These compounds are classified in the CTFA dictionary, 5th edition, 1993, under the names disodium cocoamphodiacetate, disodium lauroamphodiacetate caprylamphodiacetate disodium capryloamphodiacetate disodium cocoamphodipropionate disodium lauroamphodipropionate disodium ca- prylamphodipropionate disodium capryloamphodipropionate disodium lauroamphodipropionique acid, cocoamphodipropionic acid. Examples include the cocoamphodiacetate marketed under the trade de- nomination MIRANOL.RTM C2M concentrate by the company Rhodia. -C 20) alkylbetaines, (C8-C 2 o) alkylamido (C6-C8) alkylbetaines, your alkylamphodiacéta- and mixtures thereof. wherein the radicals R1 to R4, identical or different, represent an aliphatic radical, linear or branched, having 1 to 30 carbon atoms or an aromatic radical such as aryl or alkylaryl; the aliphatic radicals can optionally contain heteroatoms (O, N, S, halogen). The aliphatic radicals are for example chosen from alkyl C12-C22, alkoxy, polyoxy C2-C6 alkylene, alkylamide, (C12-C22) alkyl amido (C2-C6), alkyl (C12-C22) acetate having hydroxyalkyl from 1 to 30 carbon atoms. X "is an anion selected from the group of halides, phosphates, acetates, lac tates, alkyl (C2-C6) sulfates, alkyl- or alkylarylsulfonates. - X is an anion selected from the group of halides, phosphates, acetates, lactates, (C2-C6) sulfates, alkyl- or alkylarylsulfonates. Preferably, R5 and R6 denote a mixture of alkenyl or alkyl of 12 to 21 carbon atoms for example derived from fatty acids of tallow, R7 is methyl, R8 denotes hydrogen. One such product is eg quaternium-27 (CTFA 1997) or Quaternium-83 (CTFA 1997) sold under the names Rewoquat ® W75, W90, W75PG, W75HPG by Witco. - X "is an anion selected from the group of halides, acetates, phosphates, nitrates, ethyl sulfates and methyl sulfates. - R17, R19 and R21, identical or different, are chosen from hydrocarbon radicals, C7-C21, linear or branched, saturated or unsaturated. - r, n and p identical or different, are integers from 2 to 6. - there is an integer from 1 to 10. - x and z, which are identical or different, are integers ranging from 0 to 10. - X "is a simple or complex anion, organic or inorganic with the proviso that the sum x + y + z is 1 to 15, that when x is 0, then R16 denotes R20 and that when z is 0, then R18 denotes R22..
R15 alkyl radicals may be linear or branched and more particularly linear. R15 denotes a methyl radical preferences, ethyl, hydroxyethyl or dihydroxypropyl Thyle, more particularly a methyl or ethyl radical. Advantageously, the sum x + y + z is 1 to 10. When R16 is a hydrocarbon radical R20, it may have 12 to 22 carbon atoms, or have from 1 to 3 carbon atoms. When R18 is a hydrocarbon radical R22, it preferably has from 1 to 3 carbon atoms. Preferably R17, R19 and R21, identical or different, are chosen from hydrocarbon radicals in C11-C21 linear or branched, saturated or unsaturated, more particularly from alkyl and alkenyl radicals in C11 -C21 linear or branched, saturated or unsaturated. Preferably x and z, which are identical or different, are 0 or 1. Preferably y is 1. Preferably r, n and p, identical or different, are 2 or 3, and more particularly are equal to 2. The anion X "is preferably a halide (chloride, bromide or iodide) or an alkyl (C1-C4), more particularly methyl sulphate. The anion X" may also represent methanesulfate, phosphate, nitrate, tosylate, an anion derived from an organic acid (such as acetate or lactate) or any other anion compatible with the ammonium containing an ester function. Surfactants may be for example salts (chloride or methylsulfate) of diacyloxyéthyldiméthylammonium to diacyloxyéthylhydroxyéthyldiméthylammo- nium, of monoacyloxyéthylhydroxyéthyldiméthylammonium to triacyloxyéthylmé- thylammonium to monoacyloxyéthylhydroxyéthyldiméthylammonium and Me- diapers. The acyl radicals of 14 to 18 carbon atoms and more particularly from a vegetable oil such as palm oil or sunflower oil. When the compound contains more acyl radicals thereof may be the same or different. Such compounds are for example marketed under the names Dehyquart ® by Cognis, Stepanquat ® by the company Stepan, NOXAMIUM ® by Ceca, Rewoquat ® WE-18 by Rewo-Goldschmidt. vi) quaternary ammonium salts and in particular chloride béhényltπmé- thylammonium, methosulfate dipalmitoyléthyl hydroxyethyl methyl ammonium, cétylthméthylammonium chloride, quaternium-83, chloride BE- hénylamidopropyl-2,3-dihydroxypropyl dimethyl ammonium chloride and palmitic tylamidopropyltriméthylammonium. Other ingredients may be present in the aqueous dispersion of copolymerizable lymère silicone according to the invention; these ingredients may be introduced for example into the aqueous phase or the organic phase during the preparation of the dispersion. It may well include, alone or mixed: cationic silicones, anionic and / or nonionic hydrophilic or hydrophobic grafts; plasticizers; leveling agents or coalescence; solid fats such as fatty alcohols, fatty acids, vegetable or mineral waxes; conditioning agents including types of cationic polymers with polyamines; polymers including capping, anionic (neutralized or not), cationic or nonionic; pH agents, bases or acids; dyes, pigments, organic or inorganic; sunscreens, fragrances, pepti- sants, preservatives, amino acids, vitamins; thickeners; silanes. - i) solubilization of the copolymer in an organic phase; Preferably, the copolymer is present in an amount of 2 to 60% by weight, especially 5 to 40% by weight or 8-25% by weight, in the organic phase. Preferably the surfactant represents 0.01 to 15% by weight, especially 0.05 to 10% by weight, or 0.1 to 5% by weight of the organic phase comprising the copolymer weight. Preferably, 0.5 to 50 parts by weight, especially 0.8 to 20 parts, of an aqueous phase comprising surfactants, in particular 1 to 12 parts, or even 2 to 8 parts per 1 part of the organic phase comprising copolymer. Preferably, emulsification is effected at a temperature of 15 to 100 0 C, in particular from 18 to 50 0 C, or 20-30 ° C at a rate between 50 and 30 000 revolutions / minute, in particular 200 to 10 000 revolutions / minute, by any means known in the art, including a homogenizer, especially Ultrathurax kind. Optionally, it can then evaporate all or part of the organic phase, by any suitable technique considered by those skilled in the art, such as evaporation under reduced pressure (vacuum). It is thus possible to finally obtain an aqueous dispersion of copolymer polysi- siloxane / polyurea, whose dry matter content may be between 0.1 and 50% by weight, especially 0.5 to 40% by weight, or 1 to 30 wt%, and even more preferably 2 to 25 wt%. The dispersion according to the invention may comprise compounds of the solvents and / or organic phase, which may represent from 0.05 to 80% by weight of said dispersion, preferably 1 to 70% by weight. This organic phase may also be absent (less than 0.05%, or even 0%). The dispersion may also comprise surfactants, which may represent 0.05 to 10% by weight of said dispersion, in particular 0.01 to 8% by weight, or 0.1 to 5% by weight. These surfactants may also be absent (less than 0.05%, or even 0%). The amount of polymer present in the compositions according to the invention of course depends on the type of composition and the desired properties; it can vary between 0.01 and 30% by weight, preferably between 0.1 and 20% by weight, in particular between 0.5 and 10% by weight, or even between 1 and 5% by weight of dry matter polymer, based on the weight of the cosmetic composition. - Z is a hydrocarbon chain C1-C22 linear or branched, saturated or un- saturated, may be substituted by an amine group NH2, or NHR (R = alkyl C1 -C20, particularly C1 -C6, cycloalkyl C3-C40 or aromatic C6-C30); or a hydroxy group, a thiol group, an aryl group (especially benzyl) substituted or unsubstituted; Z may be interrupted by one heteroatom (O, S, NH) or a carbonyl group (CO). - n represents an integer equal to 1 or 2. There may be mentioned for example, N- (3-acryloxy-2-hydroxypropyl) -3-aminopropyltriethoxysilane, 4-aminobutyltriethoxysilane, 3-aminopropylmethyldiethoxysilane, 3-aminopropylthéthoxysilane, 3- aminopropyltris (methoxyethoxyethoxy) silane, bis (methyldiethoxysilylpropyl ) amine, bis [3- (théthoxysilyl) propyl] urea, 3- (2,4-dinitrophénylamino) propyltrié- trimethoxysilane the hydroxymethyltriethoxysilane, the mercaptométhylméthyldiéthoxysi- lane, 3-mercaptopropyltriethoxysilane, o- (methacryloxyethyl) -N- (théthoxysilylpropyl) urethane, N- (3-methacryloxy-2-hydroxypropyl) -3-aminopropyltriethoxysilane, o- (propargyloxy) -N- (théthoxysilylpropyl) urethane, (3-triethoxysilylpropyl) -t-butylcarbamate, théthoxysilylpropylethylcarbamate, the N- (3-triethoxysilylpropyl) gluconamide, N- (3-triethoxysilylpropyl) -4-hydroxybutyramide, 3- (triethoxysilylpropyl) -p-nitrobenzamide, N- (théthoxysilylpropyl) -O-polyethylene oxide urethane, uréidopropyltriét hoxysilane, o- (vinyloxyethyl) -N- (théthoxysilylpropyl) urethane, and mixtures thereof. The silane may be used to promote the grip of the copolymer on the kérati- nic media. The silane, alone or in mixture, may be present at 0.5 to 30% by weight, especially 1 to 25% by weight or even 2 to 20% by weight, based on the weight of the composition. Can also be added to the composition, in combination with the silane, a hydrolysis of said silane agent, in particular an acidic agent such as lactic acid, citric acid, pyruvic acid, malic acid, hydrochloric acid, sulfonic acid furique, or mixtures thereof. The hydrolysis agent, alone or in mixture, may be present in an amount of 0.01 to 20% by weight, especially 0.5 to 10% by weight, or 1 to 5% by weight, based on the weight of the composition, in order to obtain preferably a pH of about 10. this hydrolyzing agent is especially added to begin the hydrolysis phase of the copolymer, which will allow its insertion in its hydrolyzed form that is ie in the form of oligomers and not in its monomeric form. The compositions according to the invention may be in any galenical form conventionally used for topical application and especially in the form of an aqueous solution or suspension, or aqueous-alcoholic; of an oily solution or suspension; a solution or dispersion of the lotion or serum type; a liquid consistency emulsion or semi-liquid type milk or cream, obtained by dispersing a fatty phase in an aqueous phase (O / W) or conversely (W / O); an aqueous or anhydrous gel, an ointment, a free or compact powder to be used as such or to be incorporated in an excipient, or any other galenic form. These compositions may be packaged, in particular in pump-dispenser bottles or in aerosol containers in order to assu- rer an application of the composition in vaporized form or in foam form. Such packaging forms are indicated, for example, when it is desired to obtain a spray, a foam for the treatment of hair. The compositions according to the invention may also be in the form of creams, gels, emulsions, lotions or waxes. When the composition according to the invention is packaged in aerosol form in order to obtain a lacquer or a foam, it comprises at least one propellant. The compositions of the invention comprise a cosmetically acceptable medium, that is to say a medium compatible with keratin materials, especially the skin of the face or body, lips, hair, eyelashes, eyebrows and nails . Depending on their nature and purpose of the composition, the ingredients of the cosmetically acceptable medium may be present in conventional amounts, easily determined by the skilled person, and can be included for each ingredient between 0.01 to 80% in weight. These include the following ingredients, alone or mixed: the ten- sioactifs nonionic, cationic, anionic and amphoteric surfactants; hydrophilic solvents (alcohols) or hydrophobic (alkanes); cationic silicones, anionic, non-ionic hydrophilic or hydrophobic grafts, phenylated or not; plasticizers, for example of polyols; spreading agents or coalescence; liquid or solid fats such as fatty alcohols, fatty acids, vegetable or mineral oils, vegetable or mineral waxes; the conditioning agents types cationic polymers with polyamines; polymers including styling, in particular anionic (neutralized or not), cationic or nonionic c; pH agents (bases or acids); dyes, organic or inorganic pigments; fillers such as pearlescent agents, TiO2, resins, clays; sunscreens; the perfumes; peptizing agents; conservatives; amino acids; vitamins. The cosmetic composition according to the invention can be in the form of a care product, cleaning and / or making up the skin of the body or face, lips, eyebrows, eyelashes, nails and hair , an antisun or self-tanning product, a personal care product, a hair product, in particular for caring for, cleaning, styling, shaping, coloring the hair. She especially finds a particularly interesting application in the hair field, especially for holding the hairstyle or shaping the hair, or the care, cosmetic treatment or cleaning hair. The hair compositions are preferably shampoos, conditioners, styling gels or care, lotions or care creams, conditioners, hair setting lotions, blow-drying lotions, fixing compositions and capping, such as lacquers or sprays; lo- tion of restructuring for hair; lotion or fall frost, pest control shampoo, lotion or anti-dandruff shampoo, conditioning shampoo antiseborrheic. The lotions may be packaged in various forms, in particular in vaporizers, pump-dispenser bottles or in aerosol containers in order to ensure application of the composition in vaporized form or in foam form. It may also be in the form of a hair coloring product, particularly oxidation dyeing or direct dyeing, optionally in the form of coloring shampoo; in the form of a permanent composition, de- waving or bleaching, or alternatively in the form of rinse-out composition, to be applied before or after dyeing, bleaching, perming or de- crimping or alternatively between the two steps a permanent or a hair straightening. The composition of the invention may also be in the form of a care composition, in particular moisturizer for the skin of the body or face, lips and / or skin appendages, including a care product for processing cosmetically skin and especially for moisturizing, smoothing it, the depigmentation, nourish, protect it from sunlight, or confer a specific cosmetic treatment. Thus it can be a care base for the lips, a fixing base for lipstick, sun protection composition or artificial tanning, a care composition (day, night, anti-aging, moisturizing) for the vi - wise; a mattifying composition; a cleansing composition for the skin, such as a makeup remover or a bath gel or shower, or a bread or cleaning soap; a personal care composition including a deodorant, antiperspirant, or a depilatory composition, gel or aftershave. It can also be in the form of a makeup product for the skin of the body or face, lips, eyelashes, nails or hair; in particular a foundation, a blusher, a makeup rouge or an eyeshadow, a concealer product, an eyeliner, a mascara, a lipstick, a lip gloss, a lip pencil; a nail varnish, a nail care; a temporary tattoo product for the body skin. Even more particularly, the composition according to the invention finds advantageous application to the retention of the hairstyle or shaping the hair, or the care, cosmetic treatment or cleaning of hair. The invention therefore relates to a cosmetic treatment process, especially a makeup, care, cleansing, coloring, shaping, of keratin materials, especially the skin of the body or face, the lips, the nails , hair and / or the eyelashes, comprising the application to said materials of a cosmetic composition comprising at least one compound according to the invention. Preferably, it is a cosmetic treatment process for the conditioning of hair, in particular to bring them or improve flexibility, detangling, smoothness, combability and manageability of the hair. The application of the composition can be optionally followed by a heat treatment step. The composition may also be in the form of a kit in two parts or more. These parts may be mixing at the time of use or to be applied successively on the keratinous substrate to be treated, in particular the hair. These successive applying steps can be interrupted or not by a step of manual drying with a towel, for example, or by means of a tool such as a hairdryer for example. In a preferred case of the invention, the composition comprising the dispersion according to the invention is used in a no-rinse mode. In a preferred case of the invention, the composition comprising the dispersion according to the invention is used in conjunction with a heating tool of hair shaping, such as a curling iron, a vagueur iron, iron pinking, a flat iron, heated rollers. The temperature of the heating tool used is preferably between 60 0 C and 200 0 C.
In a preferred embodiment, one may apply the inventive composition to the hair, wet or dry, step optionally followed by partial or complete drying of the hair, possibly followed by the application of a heating tool, which can be a hair dryer or a tool for simultaneously a mechanical stress and a heater (straightener, vagueur iron, iron pinking, curling iron, or not using steam). The tool temperature is preferably between 60 ° C and 200 0 C.
The invention is further illustrated in the following examples. A / preparation of the dispersions was placed 10 g of polysiloxane / polyurea (Belsil UD-80) dissolved in an organic phase consisting of 30 g of ethyl acetate, 0.5 g of cyclopentyl tadiméthylsiloxane (D5) and 10 g of hexanol. This mixture is added with stirring (magnetic stirrer) of 130 g of an aqueous solution of sodium lauryl ether sulfate 0.1%. This dispersion was then homogenized by agitation Ultrathurax at 13,000 rpm for 15 minutes. Thereby obtaining an opaque white dispersion which hexanol and ethyl acetate are evaporated under vacuum on a rotary evaporator. Finally, an aqueous dispersion (1) siloxane copolymer polysi- / polyurea comprising 8.9% copolymer, and 0.45% D5, and 0.17% surfactant. Identically, dispersions are prepared (2) to (10) below, in the lesquel- the surfactant and the copolymer are identical to those of the dispersion (1). Cetiol UT undecane / tridecane Cognis. B / 2 application time with pretreatment of the hair with a silane dispersions (1) and (3) - (10) were diluted with distilled water so as to have a final concentration of copolymer of 3.75% by weight . The dispersion (2) is used as such. They are applied to the hair after a pretreatment of the hair by the following formulation: aminopropyltriethoxysilane (10% active ingredient) in a thickened aqueous solution (hydroxyethylcellulose 0.3%) adjusted to pH 10 with lactic acid. The pretreatment is carried out with 1 g of formulation 2.7 g of hair. The exposure time is zero and at the end of the application, the hair is dried with a hair dryer. Under these conditions, the persistence of formulations (1) to (10) from 4 to 6 shampoos shampoos while maintaining the cosmetic qualities hairline and touch. The copolymer of polysiloxane / polyurea (Belsil UD80) is dissolved in hexanol. This solution was added over an aqueous solution of cationic surfactant nique (chloride cétylthmethylammonium) diluted in water and agitated by a Ul- trathurax 13000 rpm. The mixture is homogenized for 30 minutes and hexanol was removed on a rotary evaporator. Thereby obtaining an opaque white aqueous dispersion whose composition is given below. 3 / Demonstration of the effect on the shaping of the hair was coated 1 g of formulation on a strand of natural hair of 2.7 g. After drying, the shaping is carried out using a heating tool such curling iron, applied for 30 seconds, thermostat set to a temperature between 140 and 180 0 C. After cooling, the wick was suspended in the middle ambient. Is evaluated taking shape and strength over time, at TO and after 6 shampoos. 1 g of Ultra Mild shampoo Garnier is deposited on the moistened wick; the wick is mixed from the root to the tip by 10 passages; the che Me- is then rinsed under water for 10 seconds. The operation is repeated 6 times. After drying, the iron is reapplied and again suspended wick for evaluating the shape. In comparative formulation, 50% APTES solution is replaced with deionized water. It is found that the addition of amino silane in the dispersions (11) to (13) gives a tighter form, and which better maintained over time; this effect is further more residual after 6 shampoos. - n represents an integer equal to 1 or 2. 2. Composition according to claim 1, wherein the copolymer further comprises at least one additional nonionic pattern, having at least two reactive func- tions to labile hydrogens. 3. Composition according to one of the preceding claims, wherein the copolymer is a block copolymer. - preparing an aqueous phase comprising one or more surfactants; - mixing the organic and aqueous phase, followed by emulsification. 7. Composition according to one of claims 5 to 6 wherein the surfactant is selected from cationic surfactants. 8. 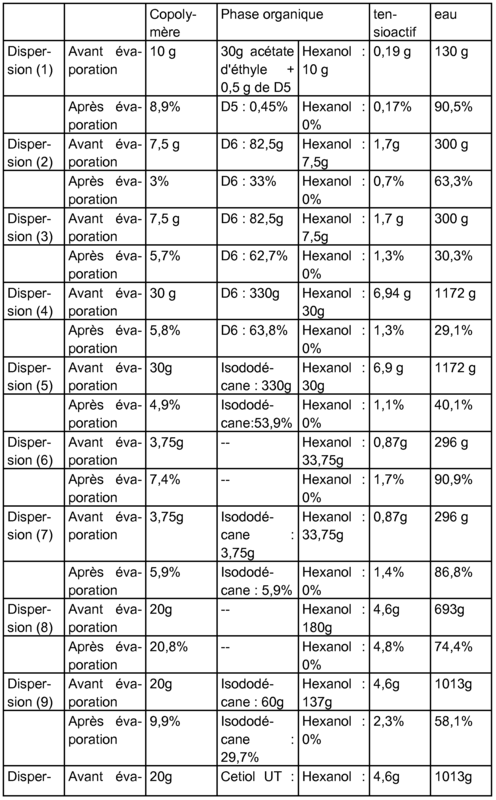 Composition according to one of the preceding claims, wherein the amount of copolymer is between 0.01 and 30% by weight, preferably between 0.1 and 20% by weight, especially between 0.5 and 10% by weight, or even between 1 and 5% by weight, polymer solids, based on the weight of the cosmetic composition. 9. Composition according to one of the preceding claims, wherein the silane is selected from N- (3-acryloxy-2-hydroxypropyl) -3-aminopropylthéthoxysilane, 4-aminobutylthéthoxysilane, 3-aminopropylmethyldiethoxysilane, 3-aminopropyltriethoxysilane, 3-aminopropyltris (methoxyethoxyethoxy) silane, bis (methyldiethoxysilylpropyl) amine, bis [3- (théthoxysilyl) propyl] urea, 3- (2,4 dinitrophénylamino) propyltriethoxysilane, hydroxyméthylthéthoxysilane the captométhylméthyldiéthoxysilane mer-, 3- mercaptopropyltriethoxysilane, o- (methacryloxyethyl) -N- (théthoxysilylpropyl) urethane, N- (3-methacryloxy-2-hydroxypropyl) -3-aminopropyltriethoxysilane, o- (propargyloxy) -N- (théthoxysilylpropyl) urethane, (3 -triéthoxysilylpropyl) -t-butylcarbamate, triethyl thoxysilylpropylethylcarbamate, N- (3-triethoxysilylpropyl) gluconamide, N- (3- triethoxysilylpropyl) -4-hydroxybutyramide, 3- (triethoxysilylpropyl) -p-nitrobenzamide, N- (th thoxysilylpropyl) -O-polyethylene oxide urethane, ureidopropyltriethoxysilane, o- (vinyloxyethyl) -N- (triethoxysilylpropyl) urethane, and mixtures thereof. 1 to 25% by weight or even 2 to 20% by weight, based on the weight of the composition. 11. Composition according to one of the preceding claims, further comprising a hydrolysis agent of the silane, in particular chosen from lactic acid, citric acid, pyruvic acid, malic acid, hydrochloric acid, sulfuric acid, or mixtures thereof. 12. The composition of claim 11 wherein the hydrolysis agent, alone or in mixture, is present in an amount of 0.01 to 20% by weight, especially 0.5 to 10% by weight, or even 1-5 % by weight, based on the weight of the composition. 13. Composition according to one of the preceding claims, which is in the form of a care, cleansing and / or making up the skin of the body or the face, lips, eyebrows, eyelashes, nails and hair, an antisun or self-tanning product, a personal care product, a hair product, in particular for caring for, cleaning, styling, shaping, coloring the hair. 14. Cosmetic treatment process, in particular make-up, care, net-toyage, coloring, shaping, of keratin materials, especially the skin of the body or face, the lips, the nails, the hair and / or the eyelashes, comprising the application to said materials of a cosmetic composition as defined in any of claims 1 to 13. 15. Kit of two or more parts comprising at least one cosmetic composition as defined in any of claims 1 to 13. FR2708199A1 (en) 1993-07-28 1995-02-03 Oreal New cosmetic compositions and uses. ES2245370T3 (en) 2006-01-01 Polyurethane dispersion in alcohol-water system.